SecureVideo - VSee: How can I test my equipment and connection? We highly encourage new users to test their equipment and connection before the start of their first videoconferences. While you can always contact our Support team by calling (888) 540-2829 or e-mailing [email protected] to ask for an orientation of the system, you can also test your connection on your own if you would prefer. These instructions are intended for account holders. 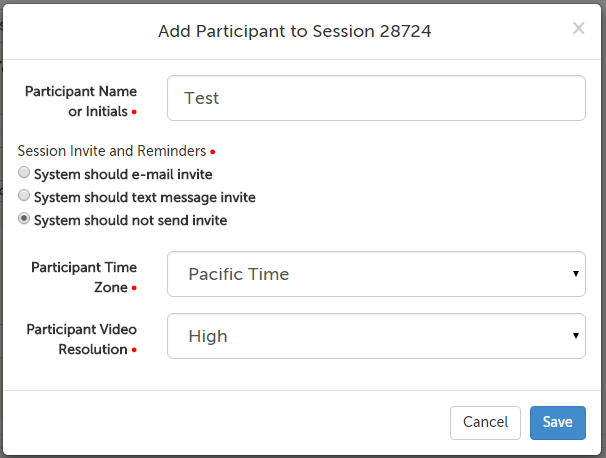 If you are a session participant, please follow the procedures in How do invitees join a videoconference session? (You can enter the waiting room before your session time to test your own connection.) You can also request a session with a SecureVideo support agent for a live test. 1. On your Dashboard, use the "New Session Now" button. 2. In the pop-up that appears, enter "Test" (or something else that you can't confuse as a real person) as the participant name and select the option, "System should not send invite". Then use the "Save" button in the lower right-hand corner. 4. 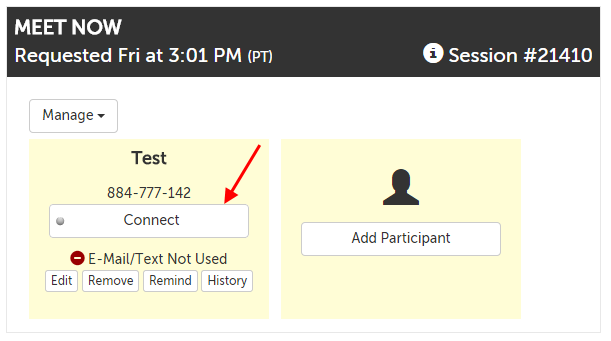 On your Dashboard, use the "Connect" button on the participant tile for "Test". 5. There will be a popup warning you that your patient is not in the waiting room yet, but you can connect by using the "Connect Anyway" button in the lower right-hand corner of the message. 6. Once your video tile launches, you can see how your audio and video looks on your own. Note: you can also wait for the system to disconnect you automatically in a few minutes, if it detects that you're not connected to anyone for that time. This article was last reviewed by our Support team on December 30, 2015.